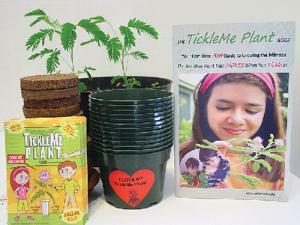 Grow a full garden of TickleMe plants, the mimosa pudica plants, which move with your touch. These sensitive plants can grow up to several feet, but their growth begins with this miniature greenhouse, peat pellets, and seed packet. Watch as your plants emerge, increase in size, and respond to your every touch. Includes instructions. The classroom kit provides everything you need for a class of 30 students to grow TickleMe Plants from seeds to flowers and then back to seeds. Contents includes 15 TickleMe Plant seed packets, (over 200 Mimosa pudica seeds), 30 flower pots, 30 expanding Wonder Soil ® wafers, and The TickleMe Plant Book with more than twenty teacher created science projects, experiments, growing tips, and easy to grow instructions. The Growing Kit includes miniature greenhouse, six peat pots, one packet of seeds and instructions with 10 experiment ideas. Caution: CHOKING HAZARD - Small parts. Not for children under 3 yrs.